Should You Invest In Foreign Bonds? The ratio between what Americans invest in domestic bonds and what Americans invest in foreign bonds is somewhere in the ballpark of 30 to 1. Given the gargantuan size of the foreign bond market, you may find that a bit surprising — especially because foreign bonds sometimes make very sensible investments. And although it was once difficult to invest in this arena, it’s very easy today, especially since the advent of exchange-traded funds; dozens of foreign-bond funds have materialized just in the past couple of years. When most investments professionals look at the world of global fixed income, they see two large categories of bonds: developed-world bonds and emerging-market bonds. Just as the U.S. government and corporations issue bonds, so too do the governments and corporations of Canada, England, France, Italy, Germany, Sweden, Japan, Switzerland, and many other countries, large and small, hot and cold, rich and not-so-rich. True, it may be difficult to find a decent sirloin in some of these distant lands, but that doesn’t mean their fixed-income offerings are all chopped meat. Foreign bonds, just like domestic bonds, come with varying maturities, risk levels, and peculiar characteristics. Some are callable, others not. Some are inflation-adjusted, others not. Some are fixed-rate, others have floating rates. Some, like U.S. bonds, tend to pay interest semiannually. Others — most European bonds, for example — pay interest annually. Needless to say, not all foreign bonds yield the same return. As you can see in the table, the current yield varies considerably. Whether they’re issued by corporations or by governments, foreign bonds may be dollar-denominated; these are often called Yankee bonds. But most are denominated in the currency of their home countries, be it euros, pounds, yen, or krona. Over the long run, you can expect that bonds of similar credit quality and duration, bearing similar risk, should yield roughly equal returns, no matter in which country they are issued or sold. After all, if British bonds consistently paid higher rates of interest than U.S. bonds, investment money would start to float eastward across the big pond. U.S. bond issuers, such as the Treasury, the State of California, and Exxon Mobil, would eventually either have to up their coupon rates or raise capital another way, such as bake sales or bingo games. On the flip side, foreign bonds, especially non-dollar-denominated bonds, tend to have limited correlation to U.S. bonds (meaning their value is independent of U.S. bonds), so owning some foreign fixed income in developed countries can be a sensible diversifier. 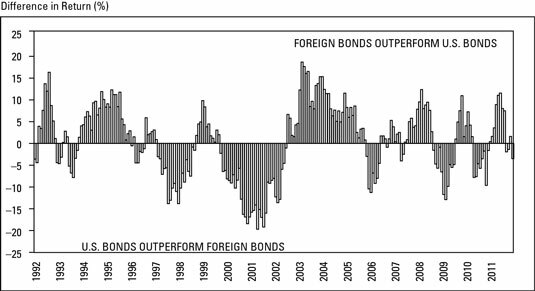 This figure offers a nice snapshot of the performance of U.S. versus foreign fixed-income securities from 1992 through the end of 2011. Investing in individual bonds is tricky. Investing in individual foreign bonds is trickier — kinda like buying a villa in Venice as opposed to a condo in Connecticut. To tap into the foreign fixed-income market, you’re better off looking at investing through a mutual fund or exchange-traded fund. Most foreign-bond funds are pricier than their U.S. cousins — by a long shot. The Morningstar Principia software can readily show more than 100 domestic bond funds with net annual management expenses of less than one-quarter of 1 percent. Not a single foreign-bond fund is that economical, and only a handful have management expenses less than 0.60 percent. In this low interest rate environment, that kind of cost difference matters. A lot. Is the diversifying power of foreign bonds worth that added expense? Just as importantly, is the added volatility due to currency flux that accompanies most foreign fixed-income investments worth the ride? If you are still going to work every morning, still in the accumulation phase of your investing career, and already have a good percentage of your portfolio in foreign currency-based investments, such as foreign stock mutual funds or exchange-traded funds, then holding foreign bonds of developed-world nations won’t serve all that much purpose. If, however, you have a large bond portfolio (say $200,000 or more), and especially if you are living off those bonds, then putting a certain amount of your bond portfolio into foreign bonds — maybe a fifth or a quarter — may make a lot of sense. The diversification effect could help smooth out your total portfolio returns and possibly boost performance. Please don’t make the assumption that you can predict currency fluctuations and start loading up on foreign bond (or stock) funds as a way to speculate on a falling dollar. Currency exchange is unpredictable. If you buy into a foreign bond fund, do it only for the diversification benefit, and keep the allocation modest. There are various mutual funds that offer exposure to foreign developed-world bonds at a relatively reasonable price. Most of these funds offer pure unhedged exposure. A few are dollar-hedged. When a fund is dollar-hedged, that means the manager is using sophisticated financial tools (usually currency forwards) to offset any currency flux. These hedged funds (not to be confused with hedge funds) are less volatile than the currency unhedged funds, but you lose a lot of the diversification power.